A first look at pro skateboarder Eric Koston's third signature release from Nike, the "Koston 3." 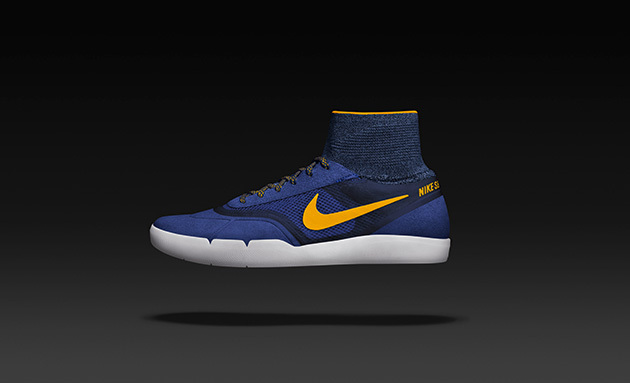 It may not appear look like it, but the Koston 3 from Nike is, in fact, a skate shoe. Koston teamed with Nike SB Footwear design director Shawn Carboy for two years to create this new look for Koston’s third signature shoe, a sneaker that reflects a change in the way the pair approached skate design and performance. Carboy says he modeled the collar from the Hypervenom soccer cleat, saying the “lockdown” fit around the ankle gives a rider more control over his or her board. And while the collar provides a completely new look in the skate world, there’s quite a bit else new to skate woven in too. Carboy created the shoe on a men’s training last to get the skateboarder “closer to the ground for a more natural feel.” And he added a new Hyperfeel sole construction, also with the aim of board closeness. Materials on the outside of the shoe help with board grip. Suede, long a popular skate material for its durability—Koston says his shoes as a kid didn’t have suede in the right spot, forcing him to duct tape the ripped canvas to stretch the wear of his sneakers—also works to grab the board. The Koston 3 includes a web rubber sidewall treated with a texture to grab the board. The more the two materials break in, the better they grab. Koston says skate design has fallen into a place where designers are out there “ripping off a Janoski” simply by moving a stitch line here or there. “There is nothing new happening and I hope [the Koston 3] kind of jars everyone else’s creativity,” he says. Koston knows the Koston 3 down to the millimeter. He knows the Koston 3 looks and performs like no other skate shoe before it. And that was the plan.